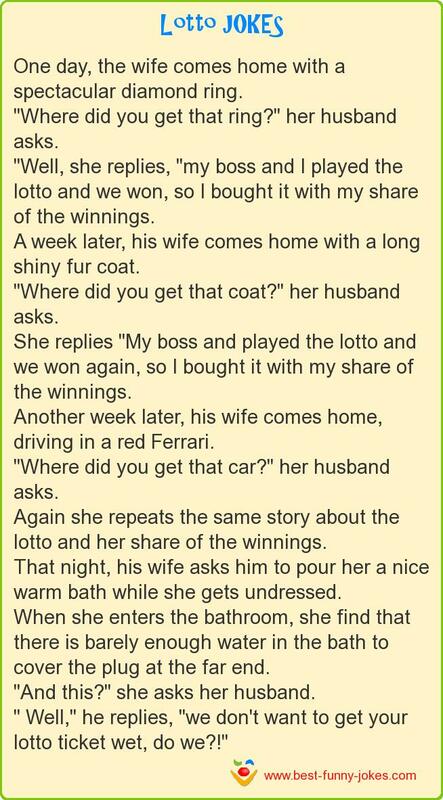 "Well, she replies, "my boss and I played the lotto and we won, so I bought it with my share of the winnings. "Where did you get that coat?" her husband asks. She replies "My boss and played the lotto and we won again, so I bought it with my share of the winnings. Another week later, his wife comes home, driving in a red Ferrari. "Where did you get that car?" her husband asks. Again she repeats the same story about the lotto and her share of the winnings. That night, his wife asks him to pour her a nice warm bath while she gets undressed. When she enters the bathroom, she find that there is barely enough water in the bath to cover the plug at the far end. "And this?" she asks her husband.
" Well," he replies, "we don't want to get your lotto ticket wet, do we?!"